Nearly 400 gathered last night at the Royal Institution in London to join Index on Censorship at their annual Freedom of Expression Awards. The event champions heroes of free speech: from websites promoting free dialogue, to lawyers fighting for human rights issues, to playwrights and artists. The evening was hosted by Jonathan Dimbleby, with contributions from Booker prize-winning novelist Howard Jacobson and Sir Tom Stoppard. 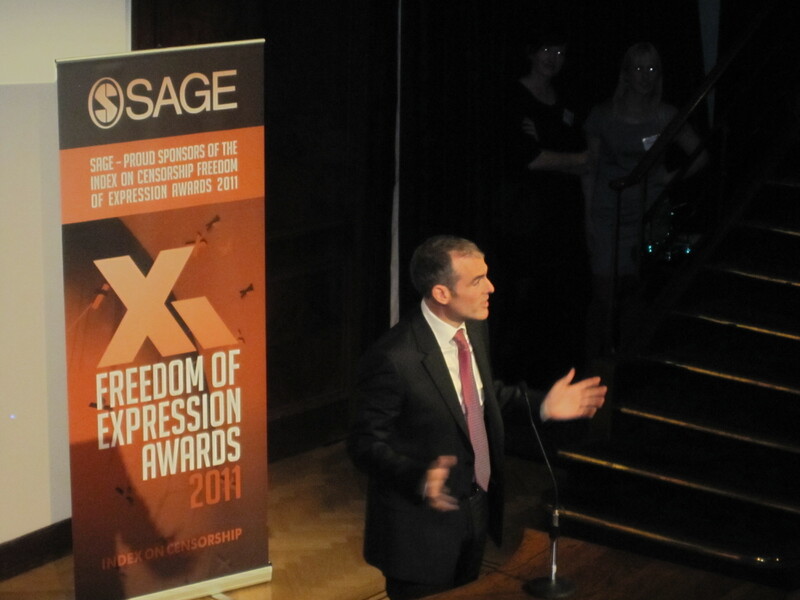 In keeping with our desire to be a real champion for authors, SAGE were lead sponsors of the 2011 Freedom of Expression Awards. Other award sponsors were the Guardian, Google, Bindmans, and the Economist. In his opening remarks, Global Publishing Director Ziyad Marar addressed the room on SAGE’s own experiences of supporting authors’ rights to free expression: from David Nutt who in 2009 was sacked from his position as chairman of the UK Advisory Council on the Misuse of Drugs for a publication in the Journal of Psychopharmacology comparing the dangers of ecstasy to horse-riding; to Barbara Maines whose ‘No Blame’ educational method was viewed in 2006 as a highly controversial approach to tackling bullying. Ziyad spoke of the many restrictions faced by authors around the world, as did others through the evening. As many commented, the work Index does to campaign for and support those around the world fighting for free expression is critical. This entry was posted in SAGE Connection, SAGE news and tagged Freedom of Expression, Howard Jacobson, Human Rights, Index on Censorship, Jonathan Dimbleby, Tom Stoppard, Ziyad Marar. Bookmark the permalink.